The dedicated teachers and administration of Khalsa Gurmat School have served children and their families in the Seattle region of the State of Washington since 2006. Our institution began with a belief that we need to come together as a community to nurture every child and ensure that they lead an inspired life. This required a partnership of families, teachers and administrators working together to create an environment that fosters learning and growth. 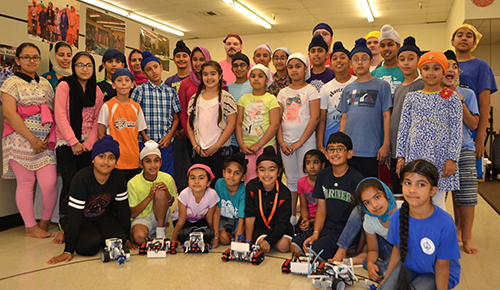 For more than 10 years, Khalsa Gurmat Center has thrived as a result of the generosity and support of parents, teachers and other donors. Families have supported the center for its vision, integrity and the belief in working for the good of all humanity (Sarbat Da Bhalla). It is where community service, the love for learning and the confidence to dream and to make those dreams a reality is instilled in all children. The three objectives that have defined the programs we incubate at the Khalsa Gurmat Center are - Educate, Empower and Engage. Our mission is to work with every child and parent emphasizing respect, responsibility, and active participation in the community. The Khalsa Gurmat School offers a challenging and engaging curriculum in a uniquely personal environment. Currently, we have courses in Sikh history, Punjabi language, Kirtan, Sikh Martial Arts, Arts and Crafts, Maths, Robotics and Creative Computing. We partner with other non-profit organizations to hold workshops for kids and parents on pursuing higher education and invite professionals who have distinguished themselves in thier careers to encourage the kids to explore different career paths. We host Legal Clinics with SABAW to provide free legal help to the public and the elderly and invite health care professionals and other non-profits who can help community members for their medical insurance and health care needs. We believe that an engaged community requires everyone to be involved in the local, state and federal civic processes. We have organized voter registration campaigns and have invited more informed disussion on issues that affect the community. Khalsa Gurmat Center is an independent non-profit school offering a challenging and engaging curriculum in a uniquely personal environment. Our mission is to work with each student emphasizing respect, responsibility, and active community participation. Our focus is Education, Empowerment and Civic Engagement for kids and community members. Currently, we provide education around Sikh history (Gurmat), Punjabi language (Gurmukhi), Classical Music (Kirtan), Arts, Maths and Creative Computing. Kids Sikhi Night is held every last Friday of the month. The diwan will start at 6:30 p.m. in the evening. This is followed by langar. The meeting is held every last Sunday of the month at 12:45 p.m.
Every last Sunday of the month at 12:45 p.m. we will have House activities or competitions.